Is worry overtaking you? Pastor Jeff Schreve, author of "Runaway Emotions," joins his wife, Debbie, to share some healthy, godly ways to deal with anxiety and worry. Bob: Are you anxious about something—concerned or stressed out? Jeff Schreve wants you to know that could be sinful. Bob: This is FamilyLife Today for Friday, July 19th. Our host is the President of FamilyLife®, Dennis Rainey, and I’m Bob Lepine. We’ll talk today about how we deal with sinful worry and other runaway emotions. Stay tuned. And welcome to FamilyLife Today. Thanks for joining us. Let me see if—I’m just going to test your musical knowledge here; okay? Bob: Just test your musical knowledge. Bob: What’s the first part? [Humming] “Don’t worry. Be happy.” [Laughter] I just thought that would be a good way for us to talk about your favorite emotion; right? Bob: Well, I guess that’s true. Bob: This—if you’ve struggled with a negative emotion in your life, this has been the one; hasn’t it? Bob: I’m not picking on you. Bob: You have said this. That peace of God is kind of spoken of as a sentinel that walks up and down in front of your heart. Sometimes, he is absent without leave—he is AWOL. The sentinel is somewhere else [Laughter] because I’m not doing a good job juggling the things that I’m concerned about that have ultimately downgraded into worry. Bob: Those three o’clock in the morning mornings where you just wake up? Dennis: Yes. Yes, where you are just stewing on stuff—thinking about it—and it’s a waste of time! Bob: Going to get you all fixed here. Dennis: If you knew how much damage there was you’d say, “There is no way!” Debbie, Jeff, welcome to the broadcast. Debbie: I’m worried that we can’t do it! Dennis: You’re worried. Yes, no doubt. Dennis: —not to be confused with Texarkana, Arkansas, by the way. He is the founder of From His Heart Ministries. They have three daughters, one grandchild, and have been on the Weekend to Remember® marriage getaway speaker team for seven years. Jeff has written a book called Runaway Emotions. You’re really talking about how we can do a better job of biblically dealing with all of the emotions that we face in life. Bob: Are you a worrier? Jeff: Yes—well, I struggle with worry. Dennis: Now, wait a second, Debbie, are you a worrier? Debbie: I’m not near the worrier that Jeff is. I mean, I think we all worry to some extent; but that would not be an overriding thing that I struggle with. Bob: But for Jeff—it is one of those besetting issues? Bob: Jeff, we’ll let you answer instead. Bob: How do you view your relationship with worry? Jeff: Well, I think that’s an emotion that I battle a lot. Just a lot of the emotions that I talk about in the book—the negative emotions—I battle with those—some more than others. And one of the things we talk about is frustration. I battled with that for a while until I really found my sense of calling, and what God had gifted me to do, and planned for me to do. Then, that alarm stopped blaring. Dennis: —it’s always been my statement that frustration is a sanctified Christian slang word for anger. Bob: No Christian gets angry. They just get frustrated. Dennis: Great answer. Now, let’s get back to what Bob was asking you about struggling with worry. First of all, what is the essence of worry? So, you know most of the things we worry about, as individuals, never happen. There was a statistic done—I can’t remember the exact number—but it was so high—of the things we worry about. You know, 50 or 60 percent of those things will never happen; but we still worry. Bob: And let me—because I’ve been picking on Dennis, here, about the fact that worry is an issue for him—let’s be honest—that a person who never worries about anything is irresponsible—is maybe in denial. The person who goes, “I’m not worried about anything,”—we’re supposed to be alert to our surroundings. We’re supposed to be cautious and on guard. When does worry become sinful? Jeff: Well, I think that you know Jesus told us, “Don’t worry,” in Matthew, Chapter 6—which I talk about in the chapter on worry—three times in ten verses: “Do not be worried. Do not be worried. Do not worry. Don’t be anxious about tomorrow for tomorrow will take care of itself.” I think anytime that concern moves into worry—and “I’m fretting about this, and I’m wringing my hands about this,” we have crossed the line. Now, we’ve gone into where it’s not just, “I’m responsible;” but now, I’ve crossed over. Bob: So, can I tell when my concern becomes sinful worry? Is there a line I can cross? Debbie: Well, I think one indicator is when you are just unable to release the thought. You just keep going back to it and circling back around. You just can’t let it go. It just consumes you. Dennis: You share a story in the book that I’d never heard you tell—back to when you were a college student and you were studying for an exam? Debbie: Don’t get him on a roller coaster. Jeff: I went from Fabio to Uncle Fester pretty quickly. [Laughter] But you know, here’s the thing: As I began to lose my hair—that’s a traumatic thing for a guy. It’s a traumatic thing for anybody. That’s one of the things—when people go through cancer treatment, chemo—losing hair is a big deal. You look different, and your looks change from month to month. And here’s the thing—when we worry, we take ownership of things. “The earth is the Lord’s and all it contains.” God owns everything; but when we take ownership—when we say, “Well, I own this,”—then, we worry about it because we worry about our stuff. We don’t ever worry about other people’s stuff. We don’t—when we buy a new car, we worry that it’s going to get dinged. Bob, if you buy a new car, I’m not worried that it’s going to get dinged because it’s not mine. Dennis: He’s got a motor scooter. Bob: It’s a scooter, yes. Jeff: I thought he had an old truck from Stepping Up™. You’re telling me that wasn’t his? Debbie: Well, “A”, I pray for him. That’s the first thing that I do. And then, we usually just sit down and talk through it and come to the conclusion that it’s really not our worry—that God is in control of it, and it’s His responsibility to take care of it. That doesn’t mean that, necessarily, instantaneously, all the worry is gone; but that we can have that kind of dialogue between each other. Dennis: —I mean, this was a big deal. It was a big deal to go through the process of having to say goodbye to people who had worked here at FamilyLife for 10, 15, 20, 25 years because what happened in the economy demanded that we had to downsize. That really plays to being responsible and goes right into a weakness of worrying. Dennis: I’ll bet it will do a wheelie. Bob: It does vibrate. It shakes a little bit. Dennis: —Bob was going by, and he nearly jumped off his motorbike! [Laughter] It was so funny! [Laughter] He had the helmet on—you know, the whole deal—and I honked at him. We were sitting at a stop light. Bob: I always wear the helmet when I’m riding on my scooter. Anyway, as we’re back to my scooter, you said you don’t worry about my car, about my scooter. You talk in the book about a time when you had a company car; right? Jeff: Right. I love having a company car. I don’t have that now; but when I worked in sales, I had a company car. It was such a different feeling—dealing with a company car versus my own car—because the company car—the company paid for everything. So, if I took it in for an oil change; and they showed me my air filter, and it was a little black, and they said, “Should we replace this?” I’d say: “By all means. Replace it.” Or if the tires are getting low, “Let’s get new tires,”—whatever needs to be done because it’s the company’s car. It needs to be top-notch. Now, if it’s my own car, we’re not replacing the air filter because I have to pay for it. The tires—well, surely, we can get another few thousand miles out of them. It’s just so totally different. And if the thing—if somebody wrecks it—if it’s sitting in the parking lot and somebody runs into it, it’s the company car. “Okay, just take it to the shop; and let’s get it fixed.” Here’s the thing—I never worried about that car because it wasn’t mine. Now, when you understand that everything in your life is a company car—your spouse, your kids, your job, your 401k—everything—it doesn’t belong to you. It’s God’s. He just lets you drive it. He lets you use it. Then, you don’t have to worry. It’s kind of like losing your hair. Once it’s all lost and once you give everything over to the Lord, then, you don’t have to worry about it anymore. That’s His worry, and He’s responsible to take care of His children. Bob: Yes. Let me ask you quickly to talk about guilt because, when we were talking beforehand, you said this is a big issue for a lot of folks. Jeff: It definitely is. I have a heart for people that feel like they’ve crossed a line with God—they’ve sinned too greatly. They are like the prodigal, and they’re at the pig sty. They just feel like, “There’s no way that God could forgive me for x, y, and z.” Lots of times, especially with sexual sin—there’s just something about it. It just covers a person with slimy fingerprints. I love the fact that God is the God of forgiveness, no matter what you’ve done; but what you need to do is you can’t cover over your sin—you have to uncover your sin. But if we choose to uncover it—confess it to God, own it, and say, “God, this is what I did, and this was wrong,”—then, He covers it in the blood of Jesus and washes it white as snow. Bob: Yes. Tell our listeners about Riley and Tracy—the couple you talk about in the book. Jeff: Well, they were a Christian couple—godly couple. They were going to get married, and they fell into sexual immorality in their dating. She became pregnant. They knew that this was going to be a difficulty, big time, because here they are representing Christ. People know they are Christians; and they are going to pretend like: “Oh, we have this Christian marriage. We did everything right as we go to the altar.” They knew it wasn’t true. So, they knew they would be espousing a lie. So, they talked to their pastor. They confessed that she was pregnant. He said, “What do we need to do about this?” And he said, “I think I need to tell the church and let them know this is what happened so that when we do stand at the altar, we can know that we’re not lying about this, and we have confessed our sin, not only to God, but we’ve told other people who need to know this because it’s going to become evident somewhere down the road.” So, they did that. Took a lot of courage, but they did that. When they got married, they both felt so pure before the Lord as they stood at the altar because there weren’t any secrets. There weren’t any elephants in the living room, covered over with a sheet. One of the things, too, that I think really makes a difference—I hammer this home with people—Acts 10:15, where Peter has the experience with the sheet coming down and the unclean things there—“Arise, Peter, kill and eat.” He said, “No, Lord, I would never do that.” He said, “What God has cleansed, no longer consider unholy.” I tell people, “Hey, when you really confess your sin to God, and you repent of that sin, He forgives you.” And a person—I don’t care what they’ve done. They can get down on their knees, confess that sin to God, repent of that sin, and get up, knowing they’re completely cleansed by the Lord. Dennis: —and ask God to meet them where they are? Father in Heaven, I pray for that one, who is listening today, that is so guilt-ridden, and just is haunted by the ghost of guilt, and is wearing guilt like a heavy cloak. Everywhere they go, Lord, they’re just hearing that alarm blaring. Remind that person, anew and afresh, that You love them. You know all about them. God, do a mighty work and help that person to believe You and walk in the peace and joy that You died for them to have. In Jesus’ name. Amen. Dennis: We know that when we ask anything according to God’s will, He hears us; and it is God’s will that people be free and have peace instead of guilt. Dennis: —not only deal with their own emotions, but maybe do a better job with the next generation—with their kids—at equipping them to know how to biblically handle their emotions, as they grow up. Bob: Yes. The book Dennis is talking about—the book that Jeff has written—is called Runaway Emotions. And you can go to FamilyLifeToday.com to request a copy of the book. Again, our website is FamilyLifeToday.com. Order from us online; or call 1-800-FL-TODAY and ask for a copy of the book, Runaway Emotions, by Jeff Schreve. Again, our toll-free number is 1-800- “F” as in family, “L” as in life, and then, the word, “TODAY”—1-800-358-6329. Or again, our website is FamilyLifeToday.com. Now, a quick word of thanks to those of you who are FamilyLife Today champions—that’s what we call you around here—those of you who help support this ministry. We think of you as champions. We could not do what we do without you. And so, those of you who are monthly supporters—Legacy Partners—to this ministry or those of you who, from time to time, will get in touch with us to make a donation to help support the ministry—you are all partners with us—champions in the cause of seeing every home become a godly home. We want to provide practical, biblical help for your marriage and for your family. And we want to see that message continue to spread in communities all around the world. So, thanks for partnering with us in that. I trust that you are making your local church your first giving priority. We hope that’s the case. As you’re able to help us beyond what you do to support your local church, we’re grateful for that support. This week, we’d like to say, “Thank you for your financial support,” by providing you with a CD that features a conversation Dennis and I had with Kim and Krickitt Carpenter. The two of them were involved in a catastrophic car accident, back, a number of years ago. In fact, Krickitt experienced significant brain trauma. When she was able to speak again, she did not remember that she was married—didn’t know who her husband was. Kim was faced with a difficult choice in terms of trying to rebuild a relationship, from the ground up, with somebody who had just gone through a significant brain injury. We’d love to share their story with you. Again, it’s our way of saying, “Thank you for helping to support this ministry.” Go to FamilyLifeToday.com. Click the button that says, “I CARE”, and make an online donation to support the ministry. Or call 1-800-FL-TODAY. Make your donation over the phone, and ask for the CD titled The Vow when you get in touch with us. Again, we’re grateful for your partnership with us, here, in the ministry of FamilyLife Today. And we hope you have a great weekend. Hope you can join us back on Monday. We’re going to hear from Rick and Kay Warren who—truth be told, they had some challenging early years in their marriage. They’ll share some of the good, the bad, and the ugly with us on Monday. Hope you can tune in for that. Jeff Schreve is a passionate communicator of the Gospel of Jesus Christ. He is a graduate of The University of Texas at Austin (1984), with a degree in Business Administration. After spending twelve years in sales, God called Jeff to preach.He graduated from Southwestern Baptist Theological Seminary in December of 2000 with a Master of Divinity degree. He served as Pastor of Membership and Missions at Champion Forest Baptist Church in Houston, TX from 1997 to 2003. He was called to First Baptist Texarkana as Senior Pastor in February of 2003 (www.fbctexarkana.org). God has blessed the church with wonderful growth, excitement, and spiritual transformation.He began a radio and television ministry called From His Heart Ministries (www.fromhisheart.org) in January of 2005. The mission of the ministry is to reach people right where they are with the love and life-changing power of Jesus Christ. Currently, From His Heart airs worldwide on The Church Channel, and around the nation on FamilyNet, CTN-Cornerstone, The Walk TV Network, Christian Satellite Radio, KHCB Radio, Oneplace.com and Lightsource.com.Pastor Jeff and his wife, Debbie, have been happily married for 27 years. 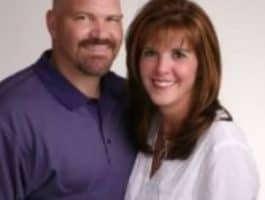 As a couple, they are part of the marriage speakers team for Family Life Ministries with Dennis Rainey. They have been blessed with three beautiful daughters: Jill - 26, Amy - 23, and Sarah - 21 ... and one awesome son-in-law, Jay Budzilowski, and the sweetest little granddaughter, Emmy Rae (3).